Over the years I have had the to work alongside many really smart, switched on people in the development community. I’ve learnt from them many intermediate and experienced programming skills. Generally when it comes understanding the very basis of how the internet functions using DNS, most of these very same experienced developers haven’t got a clue. I wrote this post to hopefully help pay back some of the awesome karma they have earned helping me over the years, by teaching them something in return. Lets learn about DNS. 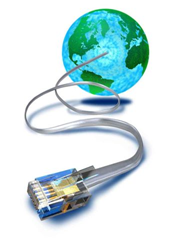 DNS is a huge part of the inner workings of the internet. spend a considerable amount of man hours a year ensuring the sites they build are fast and respond well to user interaction by setting up expensive CDN’s, recompressing images, minifying script files and much more – but what a lot of us don’t understand is that DNS server configuration can make a big difference to the speed of your site – hopefully at the end of this post you’ll feel empowered to get the most out of this part of your website’s configuration. Why does DNS matter to you? Maybe the you have allows you to manage your own DNS using a web interface, but you haven’t a clue what you are doing. The DNS that your webhost or ISP offers you is probably not the fastest – if your website grows over time, you probably want to setup your own DNS or manage it through a dedicated service such as DNSMadeEasy, ZoneEdit or DynDNS. If you already know how this works feel to step ahead. Your PC then asks your DNS server (probably configured by your router or ISP when you first started your PC) for the IP address of the server hosting the domain name you want to visit. Your ISP’s DNS server looks up the root DNS servers for the world to find out who takes care of the DNS configuration for the domain you want to visit. Your ISP’s DNS server then asks this authorative DNS server for the domain name you want’s IP information, fetches it, caches it, and then returns it to your PC. Your browser connects to this IP address and asks for a web page. There are a number of different scenarios that play a role in special circumstances with the above but I’m not really going to cover everything in this post. 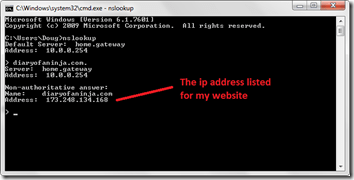 Converts hostnames to IP addresses. Stores mail delivery information for a domain. Stores miscellaneous information against a domain name (TXT records). Redirects users to a different server/site. Configure which port the client is connecting to (not entirely true; SRV records are used for protocol/port mappings for services). The Swiss Army Knife of DNS inspection is the command line tool NSLOOKUP. This is installed by default in nearly every OS you’ll ever need it on. Another cool thing the usage is the same on most platforms as well. The first thing you’ll notice about the pic above is that the first thing NSLOOKUP tells me upon launch is the current DNS server that it will use for its lookups. By default NSLOOKUP will use your current machine’s DNS settings for its DNS lookups. This can sometimes give you different results from the rest of the world as your internal DNS at your place of work/ISP may be returning different results so they can route, say your office mail, to the internal mail server IP rather than the external internet/DMZ IP address. Now if I query this blog’s domain name “diaryofaninja.com.” (ensure you place the additional period on the end of this query to avoid any internal DNS suffixes to be added) I should get back the A record for my domain; (A records are the default query type used by NSLOOKUP – I discuss DNS record types further in this post below). Below is a simple overview of all the common types of DNS records and some example scenarios. TTL – this is the “Time To Live” in seconds for a DNS record and basically means that DNS Clients of Servers accessing the requested record should not cache the record any longer than this value. If this value is set to 3600 this means to cache the returned record’s value for an hour (these values are usually the reason that IT people talk about DNS changes taking “24-48 hours” as these values are usually set quite high on hostnames that are quite static so that they offer the best performance by being kept in cache. SOA records (start of authority records) are the root of your domain’s registration. SOA records are created by your domain name registrar in the parent domain’s DNS servers (in the case of a .com domain the SOA record is created in the DNS servers for the .com root domain. In an SOA record the hostnames or IP addresses of your domain’s DNS servers are stored. These tell the internet’s root DNS servers (mother ship DNS servers) where to ask for the rest of your domain’s DNS configuration (such as A, MX and TXT records). When a client (a web browser, a mail server, an FTP client etc.) wants to connect to part of your website, it asks the locally configured DNS server for the record – the server in turn looks for the SOA records for your domain so it knows which DNS server to ask about it. Consider these records as the source of “which DNS server stores all the information about the website I want to look up”. A records store information about a hostname record for your domain name. These list the IP address that a client should talk to when using a certain hostname. If you had an address of http://mywebsite.examplecompany.com into your web browser this would refer to the A record “mywebsite” on the domain “examplecompany.com”. If you have multiple A records with the same hostname, clients will receive a list of all the records. The order of this list will change with iterate each time you query the DNS server – this is called round-robin DNS and it a simple way to spread load across multiple servers . AAAA records are the same as A records, only they stores the 128bit IPv6 address of a server instead of the IPv4 IP address – as the world shifts to using IPv6 these records will gain more relevance, but if your webhost supports IPv6 its worth setting these records up now, so that any visitors using IPv6 can access your website. A CNAME record (Canonical name) is basically an alias for an A record. This tells whoever is asking, that the DNS information for the requested hostname is stored in another record somewhere else on the internet. This other record might not even be on the same domain name or on the same DNS server. CNAME’s are very powerful as they allow you simplify your domains DNS records by centralising the information somewhere else. ISPs and webhosts commonly use CNAMEs to centralise the DNS configuration storage for things like mail or web server’s by allowing you to keep all the configuration details on a parent domain name. It is important to note that root records for a domain name (I.e the empty A record for mydomain.com) cannot be a CNAME. The simple hard and fast reason why, is that CNAME’s cannot live on the same node in a DNS forest as any other type of record – because the very nature of a CNAME record defines that all configuration for that node is stored somewhere else, and given you store other information at the root of your domain other than your A record (MX records for mail etc.) this would break every other record’s functionality. This is mentioned specifically in the RFC for DNS, section 3.6.2. When setting up your website, your webhost might for instance make the “http://www.yourwebsite.com” record for your website a CNAME that has the value “web0234.mywebhost.com” so that when trying to access “http://www.yourwebsite.com” DNS clients look up the IP address for “web0234.mywebhost.com”. This makes their life easier if the IP address for this web server changes, as they only have to update a single DNS record, instead of updating all their clients DNS records. CNAME’s are not a redirection. They are a reference pointer for a hostname. All they tell DNS clients, is that the configuration information for the hostname being queried is the same as can be found by querying the other hostname. Using the local machine’s DNS client your operating system talks to the locally configured DNS server for your local network/ISP’s network. This DNS server inturn looks up the DNS server for google.com by first looking up the SOA record for google.com and then connecting to the DNS server listed. Your local DNS server then asks the DNS server for google.com for the A record listed for www – the google.com DNS server will return an IP address for http://www.google.com. Your ISP or local network’s DNS server, along with returning it to you, will then cache this record for as long as the TTL (time to live) property of the record says. Your browser then connects to this returned IP address listed on port 80 and asks for the web page. All of the above happens in milliseconds – but you can understand that if the google.com DNS server is slow in responding this negatively affects your browsing experience. A records and CNAME records have a TTL (Time To Live) property to indicate how long they can be cached for. MX records are the internets way of telling mail where to be delivered. They list the hostname or IP address of the mail server that handles mail for a given domain name. If a mail server is looking to deliver mail to “examplecompany.com” it will look up the MX record for this domain. MX records have both a TTL (Time To Live) and a Priority (a weighting to give the order in which they should be looked up). Your mail server connects to its local network/ISP’s DNS server and asks for the MX record for otherexamplecompany.com. Your local DNS server or ISP’s DNS server looks up the SOA record for otherexamplecompany.com and then connects to the DNS server listed. It asks for the MX records for this domain and is returned a list of hostnames. it grabs the first hostname from the list (order in ascending order by Priority), runs a second query for the IP address of this mail server and returns this IP address to your mail server. your mail server then connects to this IP address on the SMTP TCP port 25 and delivers your mail. TXT records are a powerful addition to the DNS standard that allow the storage of miscellaneous information for a hostname. Many web developers, system admins and the like use TXT records for the storage of information such as SPF records and DKIM public keys. TXT records have a TTL (Time To Live) property to indicate how long they can be cached for. Name Server Records are placed in your domain’s DNS when you wish to store the configuration of part of your domain’s DNS on a separate DNS server. This can be very handy if you want to give control of a subdomain to another person/entity. i.e. my site is http://www.widgetsareus.com and I manage all of the DNS for this domain, but I would like support.widgetsareus.com and any child sub domains of this domain to be managed by the company we outsource all of our customer support to – therefore I have setup an NS record for support.widgetsareus.com to point at our support partner’s DNS servers. This might be at your webhost, or might be a third party service such as DNSMadeEasy, ZoneEdit or DynDNS. Create a new root record to point at your webserver’s IP address (this is simply an A record with an empty hostname) in your domain name’s DNS forest. Setup your webserver’s website to listen for the host-header of your domain name (IIS calls this a “binding”). Test your DNS as below. Try and access your site in a web browser. Check that the returned record value/IP address is that of your web server. Remember to do the same for “www.youdomainname.com.” if you also use www. in your domain name. 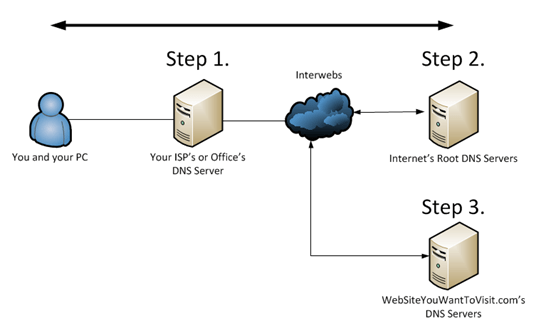 Setup a DNS server to store the configuration for yourdomain.com (Follow steps 1 and 2 above from your website if you haven’t already). 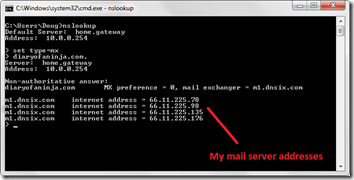 Create a new MX record that points at your mail servers IP address or hostname. Test that all the above is setup correctly using nslookup as per below. Try and send and receive email to and from your domain name. Enter “set type=mx” and hit enter. This set the query type to MX records. Check that the returned record value/IP address(es) is that of your mail server. 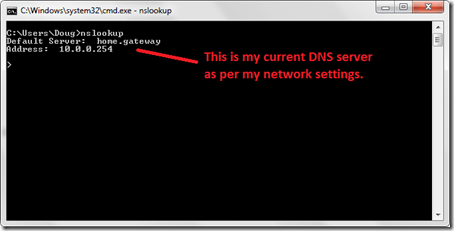 How do I check what DNS server is authorative for my domain name? You’ve set up your websites DNS, everything is fine; then one day, everyone visiting your site is directed to a site that isn’t yours! 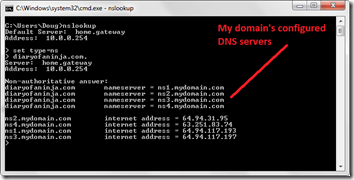 To check which DNS server is authorative for your domain name, first open a command prompt or terminal. Type ”set type=ns” and hit enter. This sets the query type to NS (NameServer) records. Confirm that the nameserver’s returned are yours. How do I check what IP address my site is currently pointing at? Split DNS is when you run a separate DNS forest for a domain name both on your external DNS servers (for everyone else to see) and also internally for staff or local users to see. Ensure local users talk to your mail server (or any other internal server) using the internal IP address, and internet users talk to your mail server’s external DMZ IP address. Block access to certain sites by giving incorrect or different DNS results for these site’s domain names. This if often how many net nanny etc softwares work. For some users my sites seems to be served from a different address – how do I check “what the world sees” vs. “what I see”? Your local DNS server may be fetching the records for your domain from a different authorative DNS server than the rest of the world. How do you investigate these things? The easiest way to investigate these things is to query an external DNS server that you know is good for the records you want, to get a better idea of how the rest of the world sees things. A really good server that is easy to remember are the ones owned by Google. The primary and secondary DNS server for Google’s Public DNS system are “8.8.8.8” and “8.8.4.4” respectively. You can use whatever DNS servers you think are more likely to see the correct values. To do this, open a command prompt/console. Type “server 8.8.8.8” and hit enter. This sets the DNS server we will query to the Google Public DNS server’s address. Type “yourdomainname.com.” and check the resulting record values. More and more organisations are looking to collaborate with partners and customers in their ecosystem to help them achieve mutual goals. SharePoint is a great tool for enabling this collaboration but many organisations are reluctant to create and maintain identities for users from other organisations just to allow access to their own SharePoint farm. It’s hardly surprising; identity management is complex and expensive. You have to pay for servers to host your identity provider (Microsoft Active Directory if you are using Windows); you have to keep it secure; you have to back it up and ensure that it is always available, and you have to pay for someone to maintain and administer it. 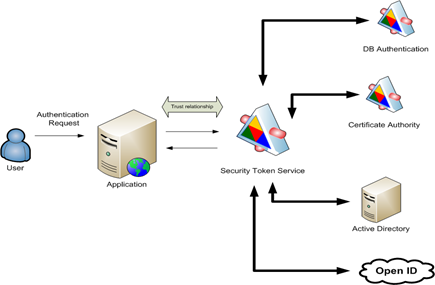 Identity management becomes even more complicated when your organisation wants to give external users access to SharePoint; you have to ensure that they can only access SharePoint and can’t gain access to other systems; you have to buy additional client access licenses (CALs) for each external user because by adding them to your Active Directory you are making them an internal user. Microsoft, Google and others all offer identity providers (also known as IdPs or claims providers) that are free to use, and by federating with a third party IdP you shift the ownership and management of identities on to them. You may even find that the partner or customer you are looking to collaborate with may offer their own IdP (most likely Active Directory Federation Services if they themselves run Windows). Of course, you have to trust whichever IdP you choose; they will be responsible for authenticating the user instead of you so you must be confident that they will do a good job. You must also check what pieces of information about a user (also known as claims; for example, name, email address etc) IdPs offer to ensure they can tell you enough about a user for your purposes as they don’t all offer the same. 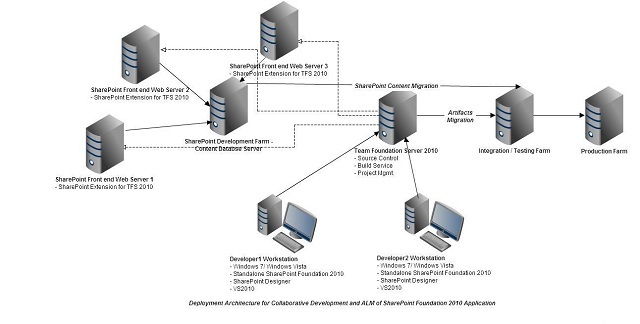 Having introduced support for federated authentication in SharePoint 2010, Microsoft paved the way for us to federate with third party IdPs within SharePoint itself. Unfortunately, configuring SharePoint to do this is fiddly and there is no user interface for doing so (a task made more onerous if you want to federate with multiple IdPs or tweak the configuration at a later date). Fortunately Microsoft has also introduced Azure Access Control Services (ACS) which makes the process of federating with one or more IdPs simple and easy to maintain. ACS is a cloud-based service that enables you to manage the IdPs used by your applications. The following diagram illustrates, at a high-level, the components of ACS. An ACS namespace is a container for mappings between IdPs and one or more relying parties (the applications that want to use ACS), in our case SharePoint. Associated with each mapping is a rule group with defines how the relying party handles the individual claims associated with an identity. Using rule groups you can choose to hide or expose certain claims to specific relying parties within the namespace. So by creating an ACS namespace you are in effect creating your own unique IdP that encapsulates the configuration for federating with one or more additional IdPs. A key point to remember is that your ACS namespace can be used by other applications (relying parties) that want to share the same identities, not just SharePoint. Once your ACS namespace has been created you need to configure SharePoint to trust it, which most of the time will be a one off task and from that point on you can manage and maintain the IdPs you support from within ACS. The following diagram illustrates, at a high-level, the typical architecture for integrating SharePoint and ACS. In the scenario above the SharePoint web application is using two different claims providers (they are referred to as claims providers in SharePoint rather than IdPs). One is for internal users and trusts an internal AD domain and another is for external users and trusts an ACS namespace. When a user tries to access a site within the web application they will get the default SharePoint Sign In page asking them which provider they want to use. This page can be customised and branded as required. If the user selects Windows Authentication they will get the standard authentication dialog. If they select Azure Provider (or whatever you happen to have called your claims provider) they will be redirected to your ACS Sign In page. Again this page can be customised and branded as required. By clicking on one of the IdPs the user will be redirected to the appropriate Sign In page. Once they have been successfully authenticated by the IdP they will be redirected back to SharePoint. By integrating SharePoint with ACS you can simplify the process of giving external users access to SharePoint. It could also save you money in licence fees and administration costs[i]. [i] The licensing model for external users differs between SharePoint 2010 and SharePoint 2013. With SharePoint 2010 if you expose your farm to external users, either anonymously or not, you have to purchase a separate licence for each server. The license covers you for any number of external users and you do not need to by a CAL for each user. With SharePoint 2013, Microsoft did away with the server license for external users and you still don’t need to buy CALs for the external users. Answer: In order to interrogate AD about “what has changed since time xyz”, we need the replicate-directory-changes permissions on partitions being synchronized, for example the domain partition being synchronized.These permissions are needed in particular to be able to read data within the deleted objects container of the partition. Standard users do not have permissions to read the content of this container, and we cannot simply grant rights over that container to the synchronization account. Answer: The replicate-directory-changes permissions will only expose sensitive data if explicitly mapped and imported into SharePoint. SharePoint out-of-the-box mappings do not expose custom AD data. This account cannot use LDAP querying to access information otherwise not available for read; it has to specifically use replication interfaces of the system to trigger sync in order to access the data. Answer: Replicate-directory-changes permissions can also be used to do a full import as well, to get consistent read, for the respective delta-imports. SharePoint admin must explicitly map a property for export, there is no out-of-the-box mapping to export to AD . Even if the SharePoint admin creates a mapping, there will be no export of the data unless additional AD permissions allow so. Replicate-directory-changes do not allow for creation, modification or deletion of data in AD. Answer: When provisioning sync (hitting start on the user profile sync service in the central admin services on server page), you must be logged in as a farm “account” who is also the local box admin on the box you are provisioning the sync service. This requirement exists because sync process needs to make some changes in the local groups and modify registry entries on the machine. This is typically done at the early install time, but with sync SP2010 follows a two-phased provisioning process which necessitates this for provision time of the sync service. Note that this requirement exists only during provisioning (moving to another machine or starting for the first time). Answer: Fire up PowerShell. Get a handle for the respective user profile service application (UPA), say $UPA. Then use the method $UPA.ResetSynchronizationMachine(). MySite clean up timer job is not active. The user profile synchronization job marks users deleted from the directory source to be deleted. When the MySite cleanup job runs, it looks for all users marked for deletion and deletes their profiles. Respective mysites are then assigned ownership to the deleted profile’s manager and an email is sent to the manager. There were users that existed in the profile store and were not brought in by user profile sync. This can occur, for example, if a customer upgraded from previous version of SharePoint. And chose to only synchronize a sub-set of domains with 2010. Answer: If your NetBIOS name is different from your domain name, at least Replicate Directory Changes permission is also needed on the cn=configuration container and you must enable NetBIOS domain names on the corresponding User Profile service application. For more information about enabling NetBIOS names on a User Profile service application, see Get-SPServiceApplication. The UPA property NetBIOSDomainNamesEnabled is used to control whether the CNC partition is included in the AD Connection or not. By default it is false (not enabled) and the CNC and associated run steps are not included in the AD Connection configuration. If it is enabled, then the CNC partition and run steps are included. To “enable” NetBIOS domain names once a connection is created requires the connection to be deleted and a new connection created with the flag turned on (set to 1 or true). This will delete all the users which had their SAMAccountNames incorrectly formed due to the NetBIOS domain name being incorrect. Answer: User profile sync serves as a staging area for data, and the data in profile store and social databases is the data consumed by the user profile service. So if the right steps are followed, you should be able to reset the sync service and related databases, without harming the user profile data.